The Neanderthals were our closest relatives who dominated the European continent from ~500,000 years ago onwards. Despite their classic portrayal as dumb brutes they are actually shared many similarities with us. Like Homo sapiens, they buried their dead (Sommer, 1999), they made jewellery (which was likely symbolic) (Zilhao et al., 2010), manufactured complex tools which take modern experts years of training to master, had language and much more. In some regards they were even superior to us, with cold-adapted bodies, larger brains, bigger eyes, stronger muscles and denser bone (Boyd and Silk, 2009). Yet only we survived into the present, with the Neanderthals dying out ~30,000 years ago (Boyd and Silk, 2009); although some populations may have survived until a bit later. Given all of the similarities between us and Neanderthals explaining why they died out yet we did not is one of the biggest mysteries in evolutionary anthropology. After decades of research, scientists have identified two major events that coincide with the Neanderthals’ extinction, indicating that one (or a combination of both) may have been responsible for their demise. These are an ice age (known as oxygen isotope stage 3, or OIS 3) and the arrival of modern humans in Europe (Banks et al., 2008). Although OIS 3 was not an especially severe period, it is notable for being highly variable. It arrived suddenly and was full of fairly rapid fluctuations in temperature. For a millennia or two it might get a bit warmer and the glaciers would retreat, but then a huge chunk of ice would break off into the Atlantic Ocean (known as a Heinrich event), disrupting ocean currents and shutting down the Gulf Stream (Banks et al., 2008). Europe during the last ice age. OIS 3 would’ve been similar, but there are no simple maps for me to show you. The Gulf Stream (known to fancy pants scientists as Atlantic Meridional Overturning Circulation) transports warm water from the equator to Europe, stopping it from freezing over. Those with a fond memory of bad movies will recall that cessation of the gulf stream is one of the key events in The Day After Tomorrow that is responsible for MASSIVE ICE HURICANES. Although that is something of an exaggeration of what will happen if the AMOC shuts down, it would still be quite severe. Remember, Britain and Canada are on the same latitude, yet because we have the AMOC heating us it’s headline news if we get a foot of snow in the winter whilst Canadians regularly take 5 feet in their stride (literally, Canadians are 90% leg). Without gritting depots and other modern conveniences this turn of events would’ve been difficult to live through. In fact, many northern Neanderthal populations died out during these severe periods unable to survive through the dramatic reductions in temperature (Hublin and Roebroeks, 2009). However, this phenomenon was not unique to OIS 3. Neanderthals had been living through ice ages – complete with several cessations of the AMOC – for their entire history. There’s even evidence of northerly populations repeatedly going extinct for hundreds of thousands of years (Hublin and Roebroeks, 2009). Thus scientists reasoned that they would’ve been able to survive this ice age as well, so it was not the primary cause of their extinction. Indeed, Banks et al (2008) examined the environments Neanderthals can survive in and plotted which areas of Europe would’ve been habitable during OIS 3. They found that even during Henrich event 4 (one of the Henrich events during OIS 3) their potential territory did not contract very much, indicating that the ice age did not render large swathes of Europe inhospitable to them. It thus seems perfectly plausible that they could’ve survived OIS 3 and so it was not one of the major factors involved in their extinction. This places the blame for their death squarely on our shoulders. But how did we kill them? Was it through competition for resources? Did we actively hunt them down? Did we use the candlestick in the conservatory? Banks et al.’s research may also provide a clue towards the right answer. They ran the same simulation of potential territory during that period for modern humans, and found that it overlapped with the Neanderthals’ almost perfectly. The left map shows potential Neanderthal territory before (A) and during (B) Heinrich event 4. The right map shows the same thing for modern humans (B – before, D – during). In other words, we would both have been living in – and thus competing for – the same resources in the same environment. Perhaps the Neanderthals could not cope with this pressure and eventually went extinct. But which of our many traits made us such strong competition? Hockett and Haws (2005) suggest it was our habit of eating just about everything we could. For years it was thought that Neanderthals only ate meat, until plant material was discovered in the plaque on a Neanderthal tooth (Henry et al., 2011). Nonetheless, it would still appear that the Neanderthals had quite a restricted diet, particularly when compared to us. Stable isotope analysis is the practice of inferring diet from the elements foodstuff leaves behind in the bones of an organism. When performed on Neanderthals, it shows that the majority of their diet consisted of terrestrial meat (Bochrens, 2009); whilst it reveals that humans ate more plants and marine resources (Hockett and Haws, 2005). Archaeological evidence confirms this, with a larger variety of species being found at human camps when compared to Neanderthal camps. This broader diet would ensure that we would reliably get enough nutrients to survive. If one of our prey species migrated away from the area or went extinct it would not matter because we had many others to fall back on. Thus our population could consistently grow. Further, Neanderthals’ large brains and muscles meant they needed more energy, so would’ve been hit hard by this additional competition removing key resources from the environment. This is not purely hypothetical either, with genetic data revealing there was a tenfold increase in human population size around this period. 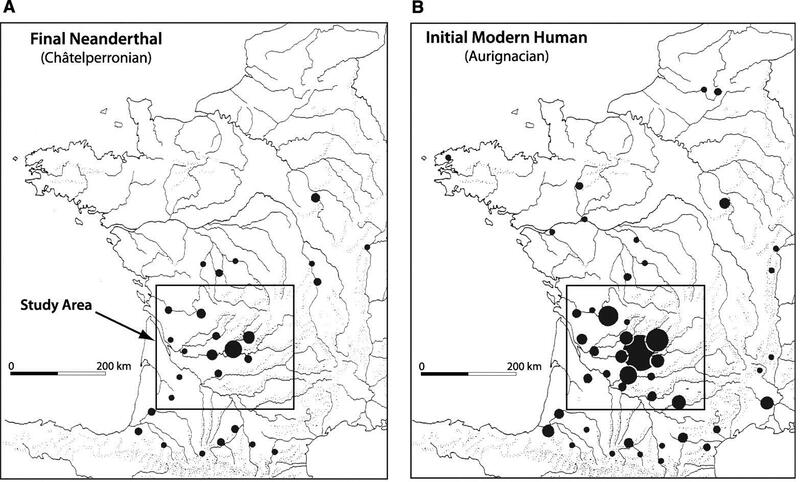 Archaeological evidence corroborates this, with the number of human sites rapidly increasing around the time Neanderthals went into decline and ultimately disappeared (Mellars and French, 2011). So it would seem that our more varied diet allowed our populations to grow faster, allowing us to out-compete the Neanderthals, eventually leading to their extinction. Some have taken this to mean that environment, or the differences in biology between humans and Neanderthals had no influence in their demise. I must disagree, since it seems like a very real possibility that these would’ve exacerbated the problems associated with human competition. Their biology – with the larger muscles and brains – required more energy (Sorensen and Leonard, 2001), so loss of key resources would’ve affected them more severely. The ice age may have already reduced the number of resources they had access to, making further reduction in resources by humans a greater problem. Nonetheless, it would seem that humans were the primary driving force behind the Neanderthal extinction. Although we did not necessarily directly hunt and kill them, our large populations took the resources they relied upon and that had the same devastating effect as if we’d gone after them with spears. Banks, W. E., d’Errico, F., Peterson, A. T., Kageyama, M., Sima, A., & Sánchez-Goñi, M. F. (2008). Neanderthal extinction by competitive exclusion. PLoS One, 3(12), e3972. Bocherens, H. (2009). Neanderthal dietary habits: review of the isotopic evidence. The Evolution of Hominin Diets, 241-250. Hockett, B., & Haws, J. A. (2005). Nutritional ecology and the human demography of Neandertal extinction. Quaternary International, 137(1), 21-34. Mellars, P., & French, J. C. (2011). Tenfold Population Increase in Western Europe at the Neandertal–to–Modern Human Transition. Science, 333(6042), 623-627. Sommer, J. D. (1999). The Shanidar IV ‘Flower Burial’: A re-evaluation of Neanderthal burial ritual. Cambridge Archaeological Journal, 9(01), 127-129. Sorensen, M. V., & Leonard, W. R. (2001). Neandertal energetics and foraging efficiency. Journal of Human Evolution, 40(6), 483-495. Zilhão, J., Angelucci, D. E., Badal-García, E., d’Errico, F., Daniel, F., Dayet, L., … & Zapata, J. (2010). Symbolic use of marine shells and mineral pigments by Iberian Neandertals. Proceedings of the National Academy of Sciences, 107(3), 1023-1028. So we ate them all, right? Is that what you’re saying? No, we ate their food. Why would they let us do that? Contra Banks et al, some people argue that the idea that the Gulf Stream and North Atlantic Drift warms NW Europe doesn’t stand up, that it as a minimal effect (see eg http://www.scientificamerican.com/article.cfm?id=new-simulations-question-gulf-stream-role-tempering-europes-winters) Any thoughts on that? As far as I can tell these models are examining the future, not the past. During the glacial periods the coastline would’ve been different, glaciers would cover Europe and so on, all of which would’ve had profound effects on wind, temperature etc. As such I’m not really sure whether this research is completely applicable to the ice age(s). However, even we do lessen the influence the AMOC has in these situations; I don’t think we can ignore it entirely. Large reductions in temperature are associated with large depositions of fresh water into the North Atlantic, so clearly something is going on here. Certainly this is an interesting possibility I was not aware of, and I’ll have to keep an eye on re-evaluation of the AMOC (and perhaps refrain from making claims about it in the future). However, this is ultimately an aside – albeit an interesting one – and does not really change our understanding of what the environment was like during the period in question. Well, because they had denser muscles and larder eyes they needed more brainpower to control them…we had advantage since we had more brainpower for thinking, despite we had slightly smaller brains. Actually Neanderthals went extinct 40.000 years ago. My own belief is that this was mainly due to the repeated sudden low air pressure events from climate change. Neanderthals differed from modern humans in many ways. One of the most striking is that they had far bigger lungs. It is known already that Neanderthals became extinct around the same time as repeated sudden low air pressure events due to climate change. Bats have huge lungs too and they die when they fly near wind turbines because of the sudden change to low air pressure causing their lungs to overly expand and so heamorrage. They then drop to the ground dead. Similarly, Neanderthals huge lungs heamorraged when expanding in the thin, cold air while running with spears while out hunting. That meant no meat for the non hunting members of the tribe. Inter tribe cannibalism would have occurred. Indeed there is bone cut evidence that Neanderthals were butchered in the same manner as their usual prey. Modern humans didn’t need to run as much because they had bows and arrows as well as superior frontal lobe development allowing higher order processing. Well, that’s what I think anyway.